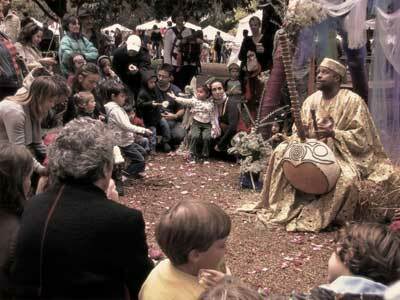 The Pasadena Waldorf School has an incredible faire that they’ve hosted for about 27 years. It is affectionately called the “Elves’ Faire.” I’ve performed at this festival for a number of years now and, each year, I’m enjoying it more and more. The organizers of the fair like to say that it will occur “rain or shine.” Well this year we got the rain, and lots of it. It was a special day for me because I had my two adult daughters and my granddaughter accompanying me. When you have adult “children” (I know, I know, “Oxymoron alert,” but those of you with maternal or paternal aspects to your personalities get it) it is rare to have everyone in the same place at the same time. I was hyped that my daughters and granddaughter were with me! As we were setting up I started introducing them to everyone, even people I didn’t know. Like I said, I was a little excited to have them with me. My storytelling sessions were outdoors in an area set up with colorful, flowing, sheer fabric surrounding me. The attention to detail at this festival is unparalleled. The drizzle had subsided, so I decided it was safe to set up my sound equipment. There were people gathering and, by the time I sat down to tune the Kora, there were about 40 to 50 people sitting in front of, and around, me on bales of hay, waiting patiently. I had about 20 more minutes before I had to begin performing but I couldn’t just keep these people waiting. So I started early and decided that I would begin again when the hour struck. It began to drizzle again but, as I sang, more and more people gathered. It was a wispy drizzle and no one was bothered by it. We sang together, they laughed at the right moments and then the story drew to a close. Just as the story ended, dark clouds burst forth a light rain and we all ran for cover. My daughters jumped into action and covered my equipment, took my instrument and led me to a nearby dry room. It is an odd feeling seeing people you’ve had to tell; “hey wipe that food off of your nose or stop kicking your brother!” think, function and move as adults. Like I said, odd yes, but good. My granddaughter was the honorary cloud watcher. Every time the clouds would clear up and the rain subsided, her job was to come and let me know. I wasn’t about to be deterred by a little water. Each time the rain would stop, she would rush in and alert us. “Grandpa, grandpa it’s stopped raining, come tell more stories!” I was enjoying her so much. We would then race outside to the performance area and I’ start up again. It felt like the rain was knowingly teasing me. It would start and stop almost on cue. There was one moment it didn’t cooperate though. I had just begun maybe my 3rd or 4th performance when it began drizzling again. No big deal right? Well people were gathering as usual, it was becoming a large crowd. Our song was getting stronger and louder. Even the faire’s town crier came by and shouted out to the rafters that some “amazing” storytelling was going on. By the way, I really really got a kick out of that! So… we’re all gathered outside in our little storytelling community, which was continually growing and growing as the music and singing kept going. Midway into my tale, a torrential mess of water began pummeling us from above! I was caught off guard and didn’t quite know what to do, so I just kept telling my story. Did I mention it was pouring down rain? Oh, ok, I thought so. Water is pouring down my face, soaking my clothing and my feet are becoming submerged in a puddle of mud when I notice something. This was such an awesome thing to witness from my vantage point. No one, I mean not a single solitary soul was moving. Everyone was standing in the rain with me, not moving a muscle and listening to the tale. At that moment I felt a warmth of human emotion and pride in everyone standing out there in the rain with me that can only be summed up as euphoric. You might think that this is where our tale of human kindness ends but no, it doesn’t. As I was sitting there telling my story and contemplating building an ark, my eldest daughter walks across the grounds, in front of the audience and holds an umbrella over me. I wanted to stop my performance and jump up, grab her and give her the tightest hug of her life. I don’t know how many people will understand this but, as parents, there are signposts on the roads of our lives. These ephemeral, subtle signs have a way of affirming our roles as parents; they let us know that we’ve contributed something to the lives of our children that has taken root. I looked at my granddaughter’s face and eyes as her mother stood over me holding the umbrella and just felt like crying tears of joy. My granddaughter had this look of pride on her face over what she was seeing her mother do. Wow, it does something to my heart just thinking about it right now. I altered the tale so that I could end it sooner and get everyone out of the rain. When my tale ended, our little storytelling community scattered to the four directions to escape the downpour. That day, my participation in the 27th Annual Elves’ Faire gave me a gift that cannot be quantified or explained in words. It gave me memories that I will cherish and carry with me for the rest of my life.